SHROVE Tuesday or Pancake Tuesday as it is commonly know is nearly upon us and is an opportunity to use up any remainder milk, butter and eggs in the larder before Lent. reducing the waste going into our bins! An average family in Northern Ireland throw away £50 per month of food which is often edible. 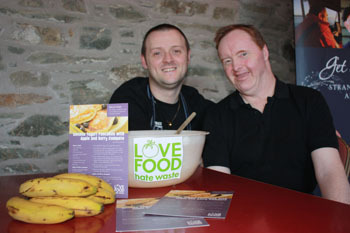 Why not try Love Food Hate Waste’s recipe for banana yoghurt pancakes this Tuesday 12 February 2013. Mix together the egg, milk, yogurt and bananas. Sieve the flour and salt with the baking powder into a large bowl, stir in the ‘wet’ ingredients and the sugar. The batter will look a little lumpy. Transfer to a mixing jug and allow to stand for 10 minutes. Heat a lightly oiled frying pan over a medium heat until smoking hot, turn the heat down and pour small amounts of batter into the pan. Cook in batches on each side until golden. Use a palette knife to flip the pancakes, put onto a plate in a warm place until you have finished cooking all the pancakes. Serve with fruit and extra yoghurt.